Dimensions: About 41" Long, 24" High, and 29" Deep. Weight of cement version: Over 200 pounds. My first cement casting of this clay model shown here was a success. Now I need to take a winter layoff. It was intense due to the large size. It took up half my garage to do the casting. I won't be able to make a new cast until next year, as soon as the weather is milder again. I'll start as soon as temperatures are at least in the 50's, most likely sometime in the Spring or Summer. The price of this dragon in cement is now reduced for a great savings. Was $2200, now sale priced at $1800. The additional cost to you for having it shipped will vary depending on your location. If you would like to pick it up yourself, you don't have to pay me the cost of shipping. You'll need to make your own arrangements on how to load it into your mode of transport. The finished cement dragon weighs over 200 pounds. It can't be lifted by the average person. You need to secure it in your vehicle in such a way that there won't be any shifting or movement of it as it's being transported. Shifting and banging into objects or vehicle walls will cause damage and/or breakage. Use the contact form at the bottom of this page to let me know if you want to come pick it up. Allow about 6 months for your order to be ready to be shipped or picked up. Casting is a process which extends over a period of many days. It has to be refined and allowed to cure after it's created. A lot more work goes into it as it's been cast. Your patience in awaiting its completion is appreciated. You will be contacted as soon as your finished piece is ready to be shipped or picked up. latex mold wears out. After that, I'll make a decision about whether to retire the design. making more after the 1st one wears out. 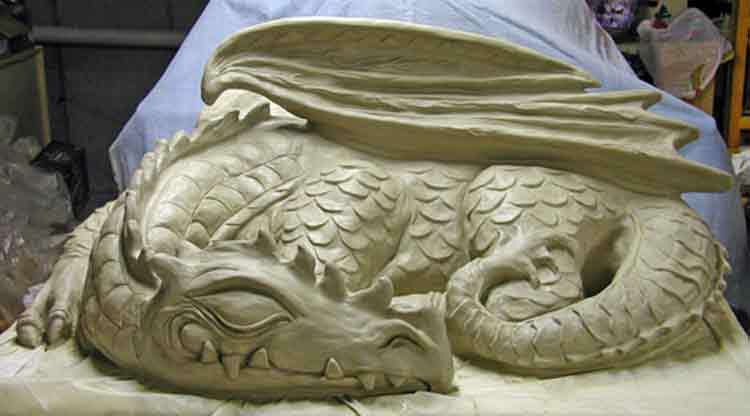 Use this Paypal button to send a deposit to reserve your dragon sculpture. Timeline is estimated at several months to completion. Use the above Paypal button to pay a deposit instantly on your personal exact repllica of this dragon. You'll be able to buy your dragon more affordably. The first payment due is $900. You'll be billed for the 2nd and final payment when the dragon is done. At that time, any applicable shipping charges will be added onto your balance due. Full payment is due upon completion of your order. Your order will be shipped as soon as your final payment has been processed. Or you can pick up your order as soon as your balance due has been processed. Your sale price applies to the former 3rd payment of $400, the amount discounted from the original total of $2200, now on sale for $1800. Extra charges still apply for shipping and special finishes. 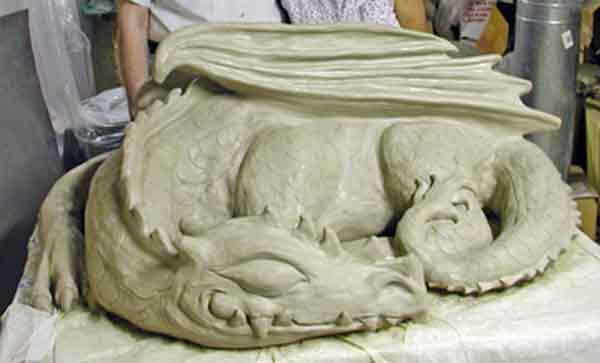 Standard finished dragon will have a super strong, acrylic polymer- or epoxy-reinforced outer cement layer and will be filled with foam products to reduce its weight. It will be OK for outdoors. Baseline $2200 price - now reduced to $1800 - does not include finish coats of color or additions such as tiles or mirrors. Contact me to discuss your choice of finishes. Many are available at various prices. For instance, I can coat it with solid colors in acrylic paint, marble look, metallic that imitates the appearance of bronze, gold, silver, or copper. You can also save money and do the color coatings yourself. Allow for additional time for your order to be finished if a special order finish is requested. 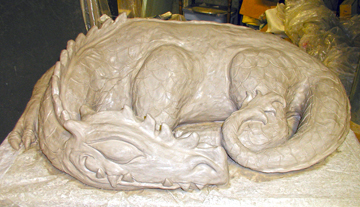 This was an early stage of my Sleeping Dragon outdoor sculpture. It didn't have its wings yet. This is the support form for the clay model that now covers it. How do you like the red tape which mimics the firey blood in his innards? As you can see in the other photos, many details have been added, including longer tail, enlarged head compete with eyes, nose horns, etc., foot claws, spines on back, and so on. Send me an email or use the below Paypal button if you're interested in pre-ordering one to have me complete it for you. I can finish it in durable cement or other materials. Many choices for colors and decoration are possible. This shows the face before I added detailing. Here's a shot of the clay model before wings were added. It took me awhile for my mind to settle on how the wings would look. Here's the dragon clay model complete with wings. I'll add a few finishing touches like dimensionality to the scales. I'll clean up the surface and remove small bits of stray clay. My cousin and her husband are posing behind it. She asked me not to publish her pic on FB. I cropped it out so that people won't access it on FB. We had a nice visit. It's not every day you get to pose your cousin behind a monster you're creating! I've worked out a way to make this to reduce its weight. The outer layer will be in cement and the inside will be filled with light-weight material which will make it durable. It should render it portable enough that you can comfortably lift it to take it in for the winter, but not have to worry about the wind blowing it away when it's outside. Cost to you estimated at around $2200 before shipping. See my blog for an idea of its size. Go to my Simon With Dragon blog post.